The temple is located 1 mile from Chidambaram railway station. 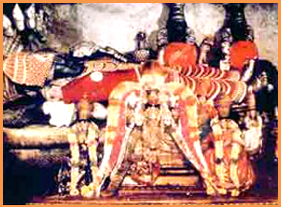 The Moolavar is Govindarajan seen in boga sayanam posture facing east. The Utsavar is Devaadidevan, Paarthasaarathy seen in seated posture. There is another utsava murthi - Chitrakoodatthullaan with his ubaya Naachiyaar. The Lord is said to have enjoyed the dance of Natarajar. The fishes in the temple pushkarini come up to the banks to accept the offerings of the devotees. Direction and Posture Bhoga Shayanam and East-faced posture. Access to the temple About one mile west of Chidambaram Station. This Kshetra is 16 kms south west of Chidambaram. This is the birthplace of Sriman Nadhamuni -- The significant Acharya of Sri Vaishnavism. Sriman Nadhamuni and Alavandhar could be worshipped at this kshetra. Sri Boovaraha could be worshipped here. The Utsava murthy is known by the name, " Yagna Varaha ".